Sports are unique in that they constantly put on display a metaphor of life. We often see an athlete, who despite his incredible ability, conditioning, and preparation, seems to have zoned out and doesn’t perform to expectations. It can happen in life as well. A man starts out in life, energized and excited about making his mark, yet over time grows weary and tired of the daily grind. His dreams become faded memories. The thrill of life is dulled by routine. As men, we must stay engaged in the fight. What fight? The fight of life. The fight to make it. The fight for our family, our fitness, our finances, and maybe our faith. In the last few years a passivity has crept into the psyche of men. Passivity may have slowly drained your energy and sapped your will. You may find it difficult to get up in the morning with the energy to take on the day. Your drive to work may be a comatose state of boredom. You may seem zoned out or disengaged. In fact, more and more workers are facing this very dilemma. Gallup recently released a new poll about Americans and their jobs which stated that 70 percent of U.S. employees are either “checked out” at work or are “actively disengaged.” According to the Los Angeles Times the “actively disengaged” workers cost the U.S. as much as $550 billion annually. There is an story in the Old Testament that describes this kind of passivity well. A great prophet, Elisha, was about to die and the King of Israel, Joash, whimpered emotionally over the dying prophet. Yet, even in his dying state, the prophet was a fighting man. He instructs the king to take arrows in his hand and strike the ground. The king picked up the fist full of arrows and struck the ground three times. Furious at his passivity, the prophet exclaimed, if you would have struck it many times, five or six times, then you would have completely defeated your enemy, but now you will only have three victories. The point of the story is to fight to the finish, to not let up, to press on toward complete victory. I have noticed that a lot of men want an excellent life with about 80 percent effort. However, if we’re going to win and win big, we must stay engaged, fighting hard against the resistance of routine and pressing toward a complete victory. Don’t be passive or timid toward your pursuit of life. Don’t give up. Don’t check out. Don’t become weary in well doing. You may be battling boredom in your marriage. Seemingly, the thrill of the romance is gone. My suggestion is to reengage your relationship. Actively pursue her. Consider that most men do not commit adultery for the relationship but for the risk and the thrill. Allowing your marriage to become boring is a dangerous thing. You may have lost the edge at work. Yesterday’s sales and achievements are dusty plaques on the wall. Past victories are not bringing in the money for today and certainly don’t guarantee future income. Get after it. Change your routine. Look for new opportunities, new leads, new prospects. Your health and fitness may have become weak and fattened. Get up early and get after it. Fight the bulge. Don’t just get on the tread mill and slow-pace it. Make it hard. Do something that gets you out of passivity. Get up and get your fight back! I’ve entered my 50’s. This is the decade when men make a choice to either allow their life, marriages, finances, and health begin a slow process of downward momentum or they reengage, get active, aggressive, and determined. I recently read that most men’s monumental successes are achieved in their 50’s. With that in mind, I am actively pursuing God’s best for my life. My wife and I date every week. I am enjoying the fruit of my labor. And even more amazing, I recently started working out at Crossfit, a brutal workout regiment. I am fighting the 50’s! I want to be in the best shape possible so that I can fulfill my purpose. I don’t want to be satisfied striking my arrows in my teens, twenties, and thirties. No, I want to strike my arrows in my fifties and sixties, and I won’t stop there! What about you? 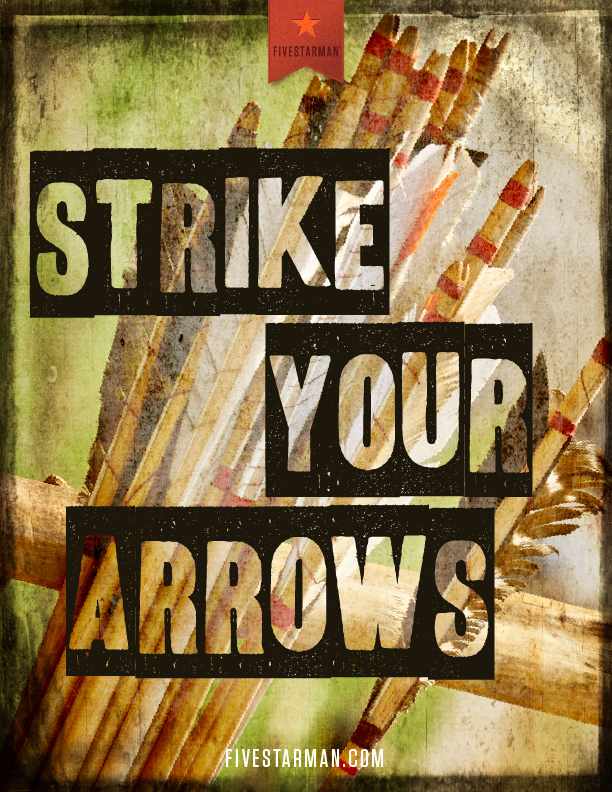 Are you going to strike those arrows? How many times? Definitely striking the arrows!This is what I need to hear since I am turning 50 this week.I stay active on all fronts but it is not enough.Thanks for pushing me. Proud of you! Keep at it. 50’s? Hey, those years are history to me. I’m 76, I work our three times a week and continue to write devotionals. The Lord wants me to give Him praise with every breath He gives me. Striking in the 70’s – going into the 80’s – proud of your example!